Is there any better flavor combination in the world than tomatoes, basil and mozzarella? If you said yes, I’d love to know what is better so I can try it asap. If you said no, then keep reading. In my opinion, there is no better combination. And one of the things that makes it so great is that it’s so simple. Just 3 fresh, simple ingredients can transform literally anything into the best thing you’ve ever eaten. Pizza, pasta, lettuce, crostini, eggs, chicken. Yep. 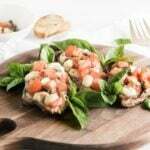 This easy tomato basil bruschetta chicken is a no brainer. 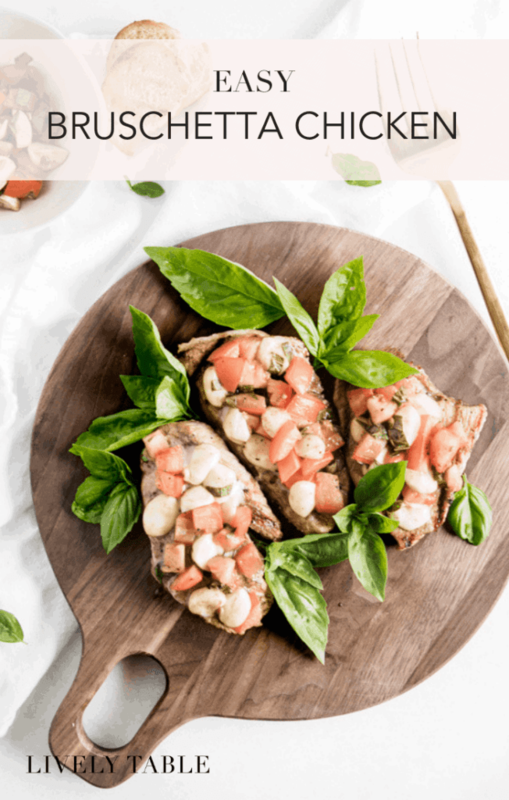 Not only is this tomato basil bruschetta chicken super delicious, it’s also extremely easy to make. All it takes is a few ingredients, and you’ve got a nutritious, tasty dinner on the table in no time. Just marinate your chicken for a bit while you prep everything, bake (or grill) the chicken while you steam some veggies or make a salad, top with the bruschetta mixture, and you’re done! Also, just a heads up, you might want to keep some toast points handy. Because you will probably have extra bruschetta to scoop up, and you’ll definitely want to eat it all. Or you could just double the tomato, basil and mozzarella mixture and have bruschetta on toast points and on chicken! I won’t judge. I actually usually do. Because it’s just so darn delicious. So. If you need a quick, healthy, and delicious dinner that is somewhat impressive but super easy to make, look no further. Tomato basil bruschetta chicken has got you covered. It’s easy enough for a weeknight, fancy enough for a weekend, and absolutely worthy of company! Butterfly chicken breasts so that you have 4 chicken cutlets (about 3/4 ” thick). Place in a shallow dish and sprinkle with salt, pepper, and garlic powder. Add balsamic vinegar and Worcestershire sauce and let marinate in the refrigerator for 15-30 minutes. Preheat oven to 375° F. lightly oil a grill pan or oven-safe baking dish with olive oil. Place chicken in the pan and bake for 25-30 minutes, flipping once halfway through, or until chicken is done and a thermometer inserted into the center reads 165° F.
While chicken is cooking, diced tomatoes and mozzarella. Thinly slice basil and mix with tomatoes and mozzarella. Once chicken is done, remove from the oven and top with tomato mixture. Place back in the oven for about 5 minutes, or until the cheese is melted. Serve immediately. Such a great summer recipe! I could dig right in! I made this over the holiday weekend, and it was amazing. I paired it with herb Israeli couscous and asparagus. I will definitely make it again. I’m so glad you enjoyed the recipe. Your pairings sound great! Thanks for stopping by!